Travelers taking a shuttle bus from MSY airport heading towards Louisiana’s New Orleans can expect to find a city that is alive and vibrant with more than its share of music, food and celebrations. Showcasing one of the most popular festivals in America, Mardi Gras is a spectacular event featuring cajun food, amazing music such as jazz and zydeco and a culture that you cannot find in any other city. The area has a long history of being a center for jazz musicians, especially the French Quarter. You should also drop by Bourbon Street which is a street in the French Quarter that is packed with nightclubs as well as restaurants and bars with a large selection of the jazz clubs. Since New Orleans is the original birthplace of jazz music you should take some time to sit back and discover the various bands performing while you visit. While you are in town you can find convenient shuttle rides such as shared ride vans and other vehicles that can range from stretched limousines to private sedans. The MSY Airport has been serving people traveling to domestic destinations despite known for being an international airport. The airport is conveniently facilitated including services like mother’s rooms for nursing women, police stations, post offices, charging stations and much more to meet the different needs of passengers going in and out of the airport. If you are looking to travel in style, then the Regal Limousine Service is just 1.1 miles from the MSY Airport. You can easily fulfil your wish to be treated royally as soon as you land. Rivertown Theaters for the Performing Arts is also easily accessible from the airport and the place is a great opportunity for people who have an appreciation for the performing arts industry. For those who have a love for science and the space, the Kenner Planetarium & MegaDome Cinema is not far from the MSY Airport. It is a great place for exploring and learning about space. For your quick shopping needs; especially for tourists hunting for souvenirs, you can find the Esplanade near the airport. 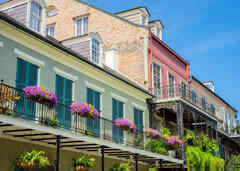 A city like New Orleans has its own unique culture and history which attracts many tourists and there are various opportunities of entertainment to enjoy around the airport. Just over 10 miles west of downtown New Orleans, stands the building of the MSY Airport. The airport is also known as the Louis Armstrong New Orleans International Airport. The airport is considered to be the primary commercial airport for the metropolitan area of the New Orleans and southeast Louisiana. There aren’t many cities as lively as New Orleans, which means there also aren’t as many airports that get as crowded. Avoid the hectic traffic by having a driver who knows the streets well. When you book a shared ride van with us, you’re not only getting a comfortable and reliable lift, but peace of mind by knowing that your driver’s method of how to get around are the easiest and most efficient way. Many believe New Orleans is a city meant for Bachelorette parties or adult-only entertainment, but many don’t realize that adults and children can admire a lot of what the city has to offer. This is especially true for the famous French Quarter, a colorful district filled with a variety of artists, tasty restaurants, and fascinating architecture. Visit the area by booking a private van from area ground transportation services. If you’d rather go to an area with less people and a lot more available parking, plan a picnic at City Park, a massive recreation area that holds over 1,000 acres of beautiful trees, rivers, and landmarks. At night, New Orleans turns into a dream city filled with alleyway jazz and distant celebrations, making it one of the most romantic destinations on earth. Go on a dark cruise through the city by booking a private sedan with tinted windows, checking out the many all-night bars like Lafitte’s Blacksmith Shop Car, which serves unforgettable daiquiris in an 18th-century pub. Keep the kids away from the bar scene by booking a safe and modern SUV rides from shuttle providers. Check out the Audubon Zoo, a park in the middle of downtown that’s home to scenery that could be out of a movie. When you’re done enjoying the exotic exhibits, take the kids out for ice cream at Creole Creamery, a classic ice cream parlor that’s famous for its malts and sundaes. If there’s one thing that is an undeniable delicacy in the city, it’s the unique flavor of New Orleans Cuisine. Whether you want fine dining at Emeril Lagasse’s famous restaurant, Emeril, or want some tasty upscale Creole at Commander’s Palace, you’ll be able to find countless places to eat – the only question is where. Arrive to the hotspot of your choice with a luxurious stretched limousine from area limo providers, each vehicle coming with its own driver and an irrefutable air of elegance. Head out to the larger-than-life Bourbon Street, a neon strip filled with live jazz and spontaneous performance art, making it a different place every time you visit. If you’ve got a larger-than-life group, contact us for a chartered bus so everyone can get in on the fun. When you’re done enjoying one of the liveliest parts of town, calm down at the small and beautiful Carousel Gardens Amusement Park, which is home to an antique carousel among other junior-sized roller coasters. When you arrive in New Orleans most travelers will land at the New Orleans Louis Armstrong International Airport before their vacation in the Big Easy begins. Many choose to stay in a hotel at the French Quarter, affectionately known to locals as the Vieux Carré. After you get yourself settled in at your favorite hotel such as the Bourbon Orleans Hotel, Le Pavillon Hotel and the Bourbon Orleans Hotel you can head toward the festivities and enjoy the high energy and non-stop nightlife filled with good music and good food. There is plenty to do in New Orleans. For one, you can check out the large variety of sea life in the vast aquariums at the Audubon Aquarium of the Americas which also has on display a dinosaur trail where you can learn about the history of these massive creatures as well as an exhibit called the Watoto Walk where visitors and their children can touch the animals one on one in an open area. If you are trying to entertain young children then you may want to consider the Louisiana Children’s Museum where they can climb a rock climbing wall, learn about various cultures from around the world or take the time to be artistic and create something new. 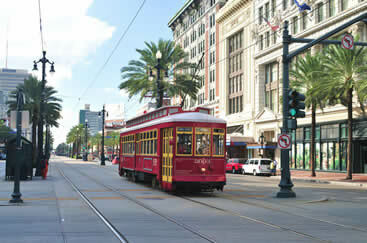 The French Quarter, located along the Mississippi river, has a great one-of-a-kind atmosphere. The streets are filled with boutiques, art galleries and some of the most famous places to eat worldwide. There are countless unique and authentic Louisiana restaurants to choose from such as GW Fins, Shaya and the Orleans Grapevine Wine Bar and Bistro. These are among the best places to eat while you are in the French Quarter. 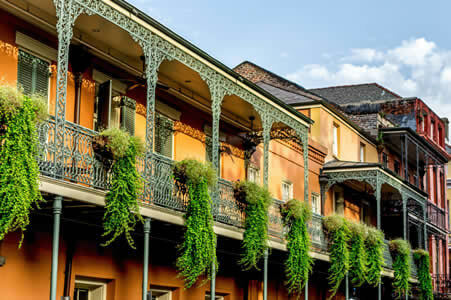 If you are looking to learn more about the area while you are in town then you can select from a variety of French Quarter Tours specializing in sightseeing of historic buildings, plantations and even a haunted tour for those who like a good scare. If you are with a group of travelers attending an event at the New Orleans Morial Convention Center you can easily get to the French Quarter since they are located under two miles from each other. Also known as Fat Tuesday, the world famous Mardi Gras celebration is a time-honored tradition in the city of New Orleans which is jam packed with events such as a parade filled with floats, carnivals and outdoor music events playing throughout the area. 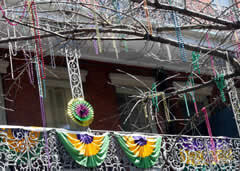 You can expect to run into a lot of parties with costumes and traditional beads while you head up and down the street in the Quarter. You can get to the parade route and the events via street cars which are one of New Orleans’ original ways to get around.